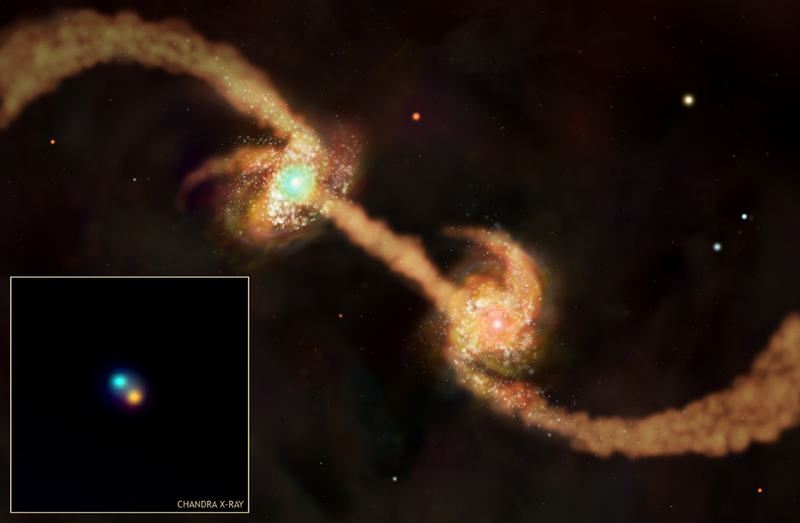 The illustration shows two young galaxies in the process of merging. The merger has triggered a prodigious burst of star formation and is providing fuel for the growth of the galaxies' central supermassive black holes. The inset shows an image from the Chandra Deep Field-North of two central black holes in merging galaxies (known as SMG 123616.1+621513). Although the black holes appear to be very close in this image, they are actually about 70,000 light years apart. 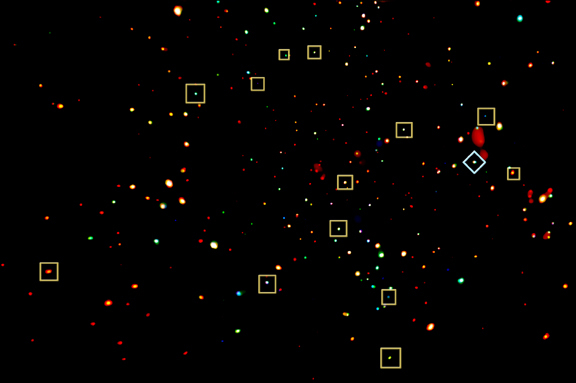 The different colors in the image are due to differences in X-ray absorption by gas and dust around the black holes with blue indicating more absorption than red. By combining data from the Chandra Deep Field-North (CDFN) with observations at submillimeter and optical wavelengths, an international team of scientists has found evidence that many extremely luminous adolescent galaxies and their central black holes underwent a phenomenal spurt of growth 10 billion to 12 billion years ago. This growth spurt may have set the stage for the appearance of quasars, distant galaxies that contain the largest and most active black holes in the Universe. The galaxies in the image are known as submillimeter galaxies, because they were originally identified by the James Clerk Maxwell submillimeter telescope (JCMT) on Mauna Kea in Hawaii. Hubble Space Telescope observations indicate that most of the submillimeter galaxies are actually two galaxies that are colliding and merging. Recent sophisticated computer simulations have shown that such mergers drive gas toward the central regions of galaxies, triggering a burst of star formation and providing fuel for the growth of a central supermassive black hole. This explains the observational evidence that in submillimeter galaxies stars are forming at a prodigious rate at the same time that the central black holes are growing rapidly. A combination of observation and theory suggests that in a few hundred million years the submillimeter galaxies will become quasars, and ultimately, large spherical galaxies that harbor central supermassive black holes with masses of about a billion Suns. Scale Inset is 1 arcmin per side. Coordinates (J2000) RA 12h 36m 45.57s | Dec +62° 10´ 26.68"